This must be one of the questions I get asked the most often! I used to mat and frame my watercolors. From time to time someone would ask if I could frame them without glass. I knew of some watercolorists who were painting on canvas or boards that were specially prepared to be absorbent enough for watercolor. I tried a number of these surfaces, and none of them gave me the look I wanted. I rely too much on allowing, or coaxing, the paint and water and paper to create their own magic. Many of the effects I use and love are a result of capillary action, and I needed paper for that (or silk, but that’s another article). 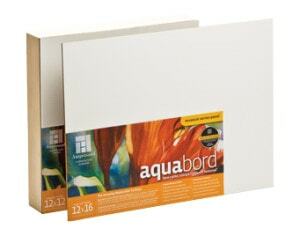 One of the special surfaces I’d tried and decided against is a product called Aquabord, made by Ampersand. Aquabord has a thin coating of clay is applied to a sheet of hardboard (you may know it by one of it’s better known brand names—Masonite). IMPORTANT!—If you are planning to try mounting your paintings the way I do, please note: I DO NOT USE Aquabord!! I use a related product called Gessobord. 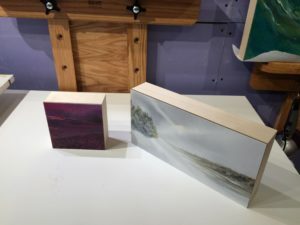 This article is for interested collectors who just want to know more about how the finished work looks and why I present my work this way. If you want to learn to do this with your own paintings, I’ve written a separate article explaining all the technical stuff. Ampersand’s boards can be purchased as flat boards (which one would then frame) or with a sort of “frame” on the back for rigidity. This is called a cradle. Boards supported with a cradle are cradled boards. This is often done to large canvases, as well, but usually on the inside of the stretchers, so the cradle is not visible when the work is displayed. It’s just there for support and rigidity. In the boards I use, the cradles are made in various depths, anywhere from 3/4″ to 2″. 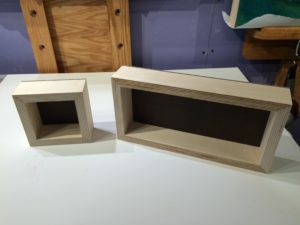 I use boards with 1 1/2 – 2″ cradles. This brings larger works out away from the wall (similar to a gallery-wrapped canvas), and allows smaller pieces to be displayed on a mantle, shelf or end-table. Two small paintings from the 30-in-30 challenge sitting on my studio table. I sometimes refer to these as little “color shots”—they make a nice way to add a little pop of color or interest anywhere in a room. Placement isn’t limited to a wall. Whether the work is hung on a wall, or displayed on a table, the cradle gives the work a finished presentation, without overshadowing it in any way. It’s a clean, contemporary look that I think suits my work well. Since there is no glass to protect the surface, I give it a couple of coats of acrylic medium (the isolation layer) and then a couple of coats of acrylic varnish. What if you DO want a frame?